Check out our Books, Documentaries, Food & Supplements and Exercise and Meditation recommendations too! Want to become a functional health coach for others? Or do you want to become a functional health coach to improve you and your family's health? Check out the FDN program. If you are interested in working with a certified FDN, please contact us and we will bridge the gap for you. OraWellness provides our families with healthy products to meet our dental care needs. Let OraWellness be your source for dental health products too! Vital Choice is our favorite place to buy healthy seafood. Wild caught seafood and accoutrements that will augment your healthy eating. he C.H.E.K Institute is one of the best places for fitness and wellness training. Paul and his team offer on-line and classroom course as well as books & audio programs. While many of the programs are geared toward fitness and health professionals, there are also many programs for those just getting started down the path to wellness. "Are you plagued by strange symptoms, unexplained fatigue, skin irritations and food cravings? You may well have a parasite or fungal infection! Paul will show you how you can heal yourself from such issues using his "from the ground up" approach, creating health, wellness and vitality." Want to keep up with the latest in health and peformance news? 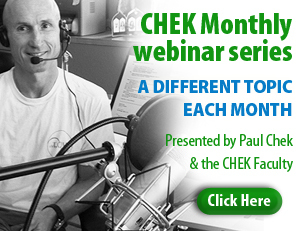 Now you can do so easily by attending Paul Chek and team's monthly webinars!